Are you living on borders or travel a lot? Then for sure you for noticed missing automatic loading of vector maps when you move close to borders. Since the version, Locus will automatically handle available vector maps and display all maps at once as one single map. No more manual switching, no more white spaces. Because Locus now fully support various ANT+ sensors, is should be shame, not to allow display various values directly in chart. 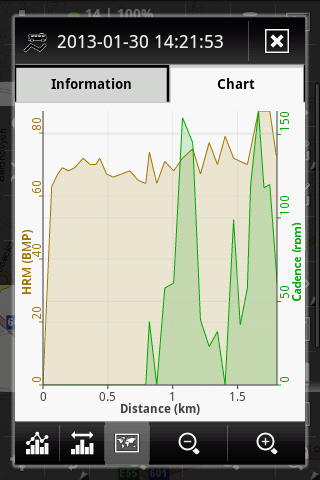 Since the version, Locus support Heart rate, Speed (from sensor) and Cadence as values in charts. Are you familiar with Locus configuration file? If not, we suggest to check it on our knowledge base. Locus now brings additional possibilities for customization of various colours and sizes of map items. I was looking forward to the new vector maps, as the “white sea” issue should be fixed. with the update I do have blue sea now (hiking theme) but for the NORWAY map everything else seems to be blue as well. Changing themes does not solve the problem. Any thoughts on this? I really appreciate all the good work! We’ve successfully resolved the issue with “white sea” around Norway. Is it possible to download corrected map from Locus store. We are also very sorry for the inconvenience – we’ve also refunded your credit. We are very sorry for this issue. The “white sea “ issue should be solved but you’re true the Norway map is corrupted. At this moment we try to solve this issue – the coastline of Norway is very complicated and this is probably our problem.